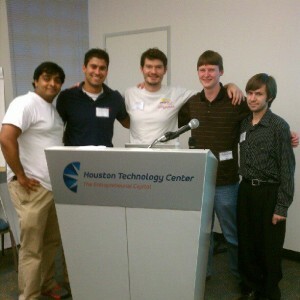 On the winning team at Startup Weekend Houston were Varun Ambrose, Bano Benavides, Bruce Haupt, Chris MacNaughton and James Wroblewski, a former student at the University of Houston C. T. Bauer College of Business. The group has now moved on to the Global Startup Battle. Voting continues on Facebook until Nov. 27. Anyone who has ever started or owned a business knows that the process of securing government permits can be confusing, complicated and costly. James Wroblewski, a former Honors student at the University of Houston C. T. Bauer College of Business, knows a way around this stumbling block. Wroblewski is a co-founder of PermitMe!, a new business that won the 2012 Startup Weekend Houston. Wroblewski and his four teammates won the feverish, 54-hour competition, held over the Nov. 9-11 weekend at Houston Technology Center, and have advanced to the Global Startup Battle. The Houston team — including former UH students Varun Ambrose and Chris MacNaughton — are now locked in battle with more than 100 teams from around the world in the Internet phase of competition. Fifteen finalists will be determined by a Facebook voting campaign that ends Nov. 27. Finalists will be announced Nov. 28, and a jury of successful entrepreneurs will name the winner Nov. 30. Wroblewski believes his Bauer College experience gave him the skills to win the competition. He credits team leader Bruce Haupt with the PermitMe! idea. Haupt works in the City of Houston’s Finance Department and holds a Master’s in Public Policy from Harvard University. The fifth team member, Bano Benavides, has a degree in environmental science with a minor in business management from Stephen F. Austin State University. Founded in 2007, Startup Weekend is a Seattle-based non-profit that organizes weekend events “where developers, designers, marketers, product managers and startup enthusiasts come together to share ideas, form teams, build products and launch startups.” As of October 2012, more than 57,000 entrepreneurs from around the world had participated in Startup Weekend, resulting in more than 5,000 startups. The Kauffman Foundation, Google and Microsoft are sponsors. Last year, Bauer professor Hesam Panahi was on the team that won Startup Weekend Houston, held on the UH campus. Moving on to the Global Startup Battle, Panahi’s team placed 3rd nationally and 16th globally. The Houston group created Tapja, an interactive story-making application for children.